We’d love your help. Let us know what’s wrong with this preview of Jack & Jill by James Patterson. Meanwhile, Washington In the middle of the night, a controversial U.S. senator is found murdered in bed in his Georgetown pied-a-terre. The police turn up only one clue: a mysterious rhyme signed "Jack and Jill" promising that this is just the beginning. Jack and Jill are out to get the rich and famous, and they will stop at nothing until their fiendish plan is carried out. To ask other readers questions about Jack & Jill, please sign up. "Jack and Jill" is the third story in Patterson's gripping novels about police detective and psychologist, Dr. Alex Cross. Here, we see Alex working on two of the most complex homicide cases of his already glittering career. Involving perhaps four or more different killers. Like the majority of the cases that Dr. Cross is assigned to, all involved seem to be complex and have peculiar, sometimes hidden motives. A number of the ensemble are working together to achieve their ultimate goals. In addi "Jack and Jill" is the third story in Patterson's gripping novels about police detective and psychologist, Dr. Alex Cross. Here, we see Alex working on two of the most complex homicide cases of his already glittering career. Involving perhaps four or more different killers. Like the majority of the cases that Dr. Cross is assigned to, all involved seem to be complex and have peculiar, sometimes hidden motives. A number of the ensemble are working together to achieve their ultimate goals. In addition, some of them seem to be competing for notoriety within the eyes of the nation's journalists and the general public. Within the crime riddled Washington D.C Alex, as always, is presented as being a loving father and good friend, just as much as he is highlighted as the most talented detective for getting into the minds of the craziest and most dangerous people on the planet. In the majority of the Alex Cross stories I have read so far, there has often been a fair amount of distress to, and violence to young children. One such case is a beautiful young girl having half of her face caved in just outside her school with a razor-wired baseball bat. These murders really hit the whole neighbourhood hard and it is a bit "too close to home" for Alex, literally as that is the school his young son Damon attends. The other targets in "Jack and Jill" are A-List celebrities and it is presented that some of the killers may perhaps have a vendetta against this way of life in America. If a book could be described as being a paperback equivalent to a supercar, it would be this one. It is full throttle all the way through and doesn't let up. Our metaphorical supercar doesn't go in a straight line from start to finish plot-wise either, there are thrilling twists, turns, betrayals, dust blocking where our senses should be looking etc... It contains many amazing set pieces such as hostage situations, Alex hanging out in the White House and brutal sexually influenced murders are but a few examples. In the Alex Cross stories, we get a 360 view of the action. We follow Alex in the first person, which creates affinity and adds drama as we are privy to his thoughts, internal monologue and deduction process intricately. The other characters, including Alex's, man-mountain sized best friend and partner, John Sampson and also, the killers are presented in an omnipresent third person view. Patterson occasionally flips between thoughts if multiple characters are involved in these chapters so that the reader is privy to everything going on. This builds up the tension sevenfold. Alex borderlines instability occasionally in some of his detective methods and still talks to a psychologist following on from the tragic murder of his wife about five years ago. In one scene he talks to one of the killers and says "I know how you feel" and his internal thoughts highlight this with a statement along the lines of ... and I really did. Just a short review on this one as I do not wish to give too much away. It was utterly awesome, thrilling and truly engaging. These stories are like reading a Die Hard film. "Jack and Jill" was excellent but, I think "Along Came A Spider" was very slightly better, perhaps because it was the first entry and introduction to the rotten Washington D.C where Alex has a lot more work to do in the future. I am an Alex Cross fan. He comes across as a really nice guy and I enjoy the domestic bits with the children and grandmother. He is also a very good cop and I like how he never takes rubbish from anyone, even his superiors. This book is standard James Patterson fare which means it is entertaining, full of action and a thoroughly good read. This particular one has multiple murders, multiple murderers and lots of red herrings. And the final identity of Jack was a total surprise - to me anyway! Reading all the Alex Cross books to date is one of my reading goals for 2018, but I’m only now done three. I enjoy them a lot and they aren’t too big so they go by quickly. So I’m hopeful. This one had two very intriguing crime plots. I usually do not get too into political thrillers but I actually really enjoyed the Jack and Jill plot. The Truth School killer was absolutely unsetting. Both plots had some very good twists and when both are revealed there is shocking moments. I did not find this Reading all the Alex Cross books to date is one of my reading goals for 2018, but I’m only now done three. I enjoy them a lot and they aren’t too big so they go by quickly. So I’m hopeful. This one had two very intriguing crime plots. I usually do not get too into political thrillers but I actually really enjoyed the Jack and Jill plot. The Truth School killer was absolutely unsetting. Both plots had some very good twists and when both are revealed there is shocking moments. I did not find this book to be predictable, and I am so glad. I love when they aren’t predictable. When Detective Alex Cross was woken by his friend and partner Detective John Sampson, their destination was to Alex’s son Damon’s nearby school. The murder of the little six year old girl was sickening and hit Alex particularly hard. Their relentless search needed to be thorough; the killer needed to be found. Meanwhile, a US senator was murdered in a particularly gruesome manner – Jack and Jill were on the hunt and had threatened that this was just the beginning – they promised they would strike When Detective Alex Cross was woken by his friend and partner Detective John Sampson, their destination was to Alex’s son Damon’s nearby school. The murder of the little six year old girl was sickening and hit Alex particularly hard. Their relentless search needed to be thorough; the killer needed to be found. More bodies, more murders – Alex and Sampson were in it up to their necks. They were determined to catch the killer or killers – but were they connected? Jack & Jill is the third in the Alex Cross series by James Patterson and is filled with the usual fast paced action; multiple murders and a home scene which I thoroughly enjoy. Nana Mama and the children bring a sense of normality to Alex’s life (and the series) and I always enjoy these books. Not sure why I hadn’t read this one a long time ago, but I have now! Recommended. A murderous duo calling themselves Jack and Jill are killing important people in Washington, D.C. Detective Alex Cross is put on the case when they threaten the President. But he would rather stay on a more personal case....children are being killed at the school Cross' young son attends. Deaths continue as Cross investigates both cases. Is anyone in Washington safe? This book is definitely filled with action and twisted suspense. Originally published in 1996, the book is a bit dated in places. B A murderous duo calling themselves Jack and Jill are killing important people in Washington, D.C. Detective Alex Cross is put on the case when they threaten the President. But he would rather stay on a more personal case....children are being killed at the school Cross' young son attends. Deaths continue as Cross investigates both cases. Is anyone in Washington safe? This book is definitely filled with action and twisted suspense. Originally published in 1996, the book is a bit dated in places. But, the story is still very much enjoyable. I found the plot in this 3rd book of the Alex Cross series to be just as action-packed and exciting as the first two books. I'm enjoying this series. I started reading just this year because the series is listed as part of The Great American Read. I'm not sure why I had never read a book by James Patterson before this year. I guess it was a case of so many books...only so much time. I'm glad I finally gave the Alex Cross series a try....it's really quite good. It will take me awhile to catch up, as the series has 25 books and Jack & Jill is only #3. Book 26, Target, is scheduled to come out in November 2018. I have lots of reading/listening to do! I listened to the audio version of this book. Narrated by Ron Butler and Maxwell Hamilton, the audio is just over 12 hours long. Both narrators read at a nice pace. I liked the fact that the narrators change when the point of view changes. Even with my hearing loss, I was still able to hear and understand the entire book. I have book 4, Cat and Mouse, on hold at the library. I'm definitely continuing with this series. I like Alex Cross as a main character. He is gritty, intelligent and hard-hitting. I like all the side characters, especially Nana Mama and Sampson. I do see a tendency in this series towards killing or victimizing any woman that Alex looks at as a possible love interest. It's happened in every book so far....and seems repetitive and unrealistic. But, this is only book 3..... If I get further in this series and this is still a major repeating plot point, it might make me stop reading. I'm suspending judgement until I get further into the series. I can see why this series is part of the list of 100 books for The Great American Read. This bestselling series has wowed readers for 25 years now. The Great American Read honors 100 books that got the American public reading and talking about books. From classics to contemporary fiction, the list is varied. Check out the list here: https://www.pbs.org/the-great-america... In my quest to read all 100 books/series, I am currently at 16. (I'm counting series listed as one, even if I read multiple books). Lots more reading to go! I love this concept -- I hope they do something similar again! I thought this book was good, but not as good as the first two. It didn't draw me in like the other ones did. The ending though was intense and the only part of the book I really got into. It announced what the fourth book was going to be about by having Gary Soneji from "Along Came a Spider" reappear in the story again. I recommend this book to anyone who liked the first two of the Alex Cross series because this book leads into the story line of the fourth book which is very good. While reading this one I couldn't help thinking, was Kiss the Girls really that good? 'Was Jack up ahead? Was Hawkins Jack? Was this Jack up ahead? Could this be Jack up ahead? Had we just been While reading this one I couldn't help thinking, was Kiss the Girls really that good? This within 3 pages. Who is this guy's editor, anyway? in in an obviously contrived effort to authenticate things (Simpsons, ER, Pulp Fiction, MTV). Now you're wondering, if I hated it so much, why did I finish it? Well, I have to admit, the story itself was quite good, and I pretty much had to see it through to see how things turned out. Given the right director and screenplay, this would make a terrific movie. Reading this book is like reading a used undergraduate textbook, only it's got italics instead of highlighter. I don't think I've ever seen so many random italics to indicate words the author thinks we should focus on. Because apparently readers aren't smart enough to decide what's important and what's just ordinary narrative. And yes, it really is annoying enough that even I, a compulsive book-finisher, am considering just returning this one to the library. Also, there's a pretty basic research Reading this book is like reading a used undergraduate textbook, only it's got italics instead of highlighter. I don't think I've ever seen so many random italics to indicate words the author thinks we should focus on. Because apparently readers aren't smart enough to decide what's important and what's just ordinary narrative. And yes, it really is annoying enough that even I, a compulsive book-finisher, am considering just returning this one to the library. Also, there's a pretty basic research error: the author uses "semiautomatic" and "revolver" interchangeably. 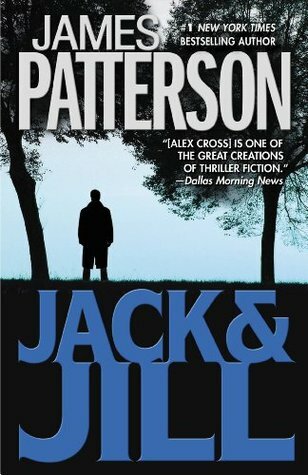 Jack and Jill by James Patterson is the 3rd book featuring Alex Cross. Alex Cross investigates the murder of a US senator with a note signed by Jack and Jill claiming this to be the start of further killings as well as the murders of children who are being battered to death. A fast paced and action packed typical Alex Cross novel with lots of twists and thrills. I liked the story okay. I liked the setting being in Washington DC as I grew up near there and it's always fun to read stories where you know some of the locations. I also still like Alex Cross as a character. I was hoping for a bit more excitement but I am going to stick with the series. This will contain a few minor spoilers but should not ruin the book for anyone. I have to admit I did not read the first two books but I did see the movie and I tend to get bored reading books AFTER seeing the movies so I skipped them. It was not hard to "catch up" on this one tho. While James Patterson is a good writer and a well known author I don't think this was one of his better books sadly. I think there were a lot of questions left unanswered and things just thrown in. I wanted to know mor This will contain a few minor spoilers but should not ruin the book for anyone. While James Patterson is a good writer and a well known author I don't think this was one of his better books sadly. I think there were a lot of questions left unanswered and things just thrown in. I wanted to know more about the game "Jack and Jill" were playing and why they were playing the board game. Neither one of the motivates were ever explained and when the true killers were caught at the end it just didn't fit for me. I was like huh? It just felt as if it didn't fit. When Christine's husband gets shot and killed I sort of felt like it was a way Alex could finally be with her without it seeming so horrible. You never meet her husband or know how she feels about his up until this point but you know how Alex feels about her every time he see's her to the point it gets annoying and obsessive. Στην Ουάσιγκτον, την πόλη όπου ζει και εργάζεται ο ντετέκτιβ Άλεξ Κρος, ένα ζευγάρι αρχίζει να δολοφονεί διάσημους ανθρώπους αφήνοντας στον τόπο του εγκλήματος αυτοσχέδια μηνύματα με το ψευδώνυμο «Τζακ και Τζιλ». Αυτή η σειρά των δολοφονιών όμως έχει βάλει σε υποψίες τον Λευκό Οίκο και τις μυστικές υπηρεσίες, μιας και έτσι αποκαλούνται με κωδικό τρόπο ο Πρόεδρος των ΗΠΑ και η Πρώτη Κυρία. Έτσι, ο Άλεξ Κρος καλείται στα άδυτα του Λευκού Οίκου να συνεργαστεί με το FBI αλλά και με τη CIA, σε περίπτ Στην Ουάσιγκτον, την πόλη όπου ζει και εργάζεται ο ντετέκτιβ Άλεξ Κρος, ένα ζευγάρι αρχίζει να δολοφονεί διάσημους ανθρώπους αφήνοντας στον τόπο του εγκλήματος αυτοσχέδια μηνύματα με το ψευδώνυμο «Τζακ και Τζιλ». Αυτή η σειρά των δολοφονιών όμως έχει βάλει σε υποψίες τον Λευκό Οίκο και τις μυστικές υπηρεσίες, μιας και έτσι αποκαλούνται με κωδικό τρόπο ο Πρόεδρος των ΗΠΑ και η Πρώτη Κυρία. Έτσι, ο Άλεξ Κρος καλείται στα άδυτα του Λευκού Οίκου να συνεργαστεί με το FBI αλλά και με τη CIA, σε περίπτωση που οι δύο δολοφόνοι απλώς πειραματίζονται και τελειοποιούνται, με τελικό στόχο τη δολοφονία του Προέδρου Τόμας Μπερνς. Ταυτόχρονα, εξάχρονα και εφτάχρονα παιδάκια δολοφονούνται στη γειτονιά του Άλεξ Κρος όμως η δυάδα των Τζακ και Τζιλ αποσπά τη μερίδα του λέοντος στα ΜΜΕ, κάτι που εξοργίζει τον δολοφόνο των παιδιών και η κατάσταση σύντομα θα εκτραχυνθεί! Αυτή είναι η τρίτη περιπέτεια που έγραψε ο James Patterson με ήρωα τον Άλεξ Κρος και η υπόθεση είναι αρκετά ενδιαφέρουσα, γεμάτη ανατροπές και εκπλήξεις. Ο υπαρχηγός ντετέκτιβ στο Τμήμα Ανθρωποκτονιών της Ουάσιγκτον και ψυχολόγος έχει ήδη ξεκινήσει τις έρευνες για τις δολοφονίες των παιδιών όταν τον καλούν (και τον αποσπούν) εσπευσμένα στον Λευκό Οίκο. Η υπόθεση «Τζακ και Τζιλ» είναι σκοτεινή, δύσκολη και ανεξιχνίαστη. Το FBI φοβάται πως είναι τόσο καλά οργανωμένη που υπάρχει κάποιος εγκέφαλος από πίσω ενώ η CIA φτάνει στο σημείο να υποψιάζεται πως ίσως κάποιος από τους πληρωμένους δολοφόνους που χρησιμοποιούν για ρύθμιση κάποιων εσωτερικών υποθέσεων της χώρας έχει χάσει τον έλεγχο! Εκτυλίσσεται δηλαδή μια απίστευτη συνωμοσιολογία, η οποία σε συνδυασμό με την ατμόσφαιρα φόβου και αγωνίας που επικρατεί εν όψει της πιθανής δολοφονίας του Προέδρου, δίνει την αφορμή στον συγγραφέα να καταγράψει, αν και διακριτικά, τον πατριωτισμό που διακρίνει τον μέσο Αμερικανό απέναντι στην καθεστηκυία τάξη της χώρας του. Η καθαυτή υπόθεση είναι έξυπνη και με πολλά μυστικά. Χωρίς να κατονομάζονται αρχικά (αν και η Τζιλ αποκαλύπτεται), ο Τζακ και η Τζιλ παρουσιάζονται με μεγάλη οξυδέρκεια και διεισδυτικότητα. Το παράλογο σκεπτικό τους, η περίεργη σχέση που έχουν μεταξύ τους, η έλλειψη μοτίβου και συγκεκριμένου σχεδίου εκτέλεσης είναι αυτά που δίνουν άφθονη αγωνία στον αναγνώστη ως την τελευταία σελίδα. Ναι, η Τζιλ αποκαλύπτεται σε κρίσιμο σημείο όμως αυτό δεν είναι τίποτα σε σύγκριση με την πραγματική ταυτότητα του Τζακ που αργεί να αποκαλυφθεί, μιας και είναι η μεγάλη ανατροπή της ιστορίας! Τα πράγματα γίνονται χειρότερα όταν το δίδυμο αυτό χρησιμοποιεί έναν ελεύθερο σκοπευτή για να θολώσει τα νερά γύρω από τις ταυτότητές τους και οι περιγραφές της αιματηρής επίθεσης κατά του Προέδρου στο ταξίδι του στη Νέα Υόρκη είναι καλογραμμένες και ολοζώντανες. Ποιος όμως κρύβεται πραγματικά πίσω από το θανάσιμο ντουέτο και γιατί αποσκοπούσε εξαρχής στην εκτέλεση του Προέδρου είναι κάτι μη αναμενόμενο. Ο δολοφόνος των παιδιών είναι εξίσου δαιδαλώδης σαν υπόθεση και ο συγγραφέας χρησιμοποιεί ένα έξυπνο συγγραφικό τέχνασμα για να δυσκολέψει τον αναγνώστη ως προς την πραγματική ταυτότητά του. Μου άρεσε που ξεκίνησε «ο καημένος» τις δολοφονίες σχεδόν ταυτόχρονα με τους Τζακ και Τζιλ κι έτσι άρχισε να γίνεται άτσαλος και ριψοκίνδυνος, ώστε να τραβήξει τα φώτα πάνω του. Το μυθιστόρημα γράφτηκε το 1996, οπότε η χρήση του δικτύου Prodigy της ΙΒΜ που χάκαρε ο δολοφόνος για να στρέψει τις υποψίες αλλού και ο τρόπος που λογοκρίθηκαν τα μηνύματά του προς τους συνδρομητές του δικτύου μου θύμισε την κοινότητα του facebook και νοστάλγησα σχεδόν την ανάγκη που είχε η ανθρωπότητα από τόσο παλιά για άμεση και γρήγορη επικοινωνία. Σε προσωπικό επίπεδο, ο Άλεξ Κρος, που πλέον έχει αρχίσει να κουράζεται από όλη αυτήν τη βία και ονειρεύεται να αποσυρθεί από την ενεργό δράση για να δουλέψει πάλι ως ψυχολόγος και μόνο, συνεργάζεται στενά με τον παιδικό του φίλο και συνάδελφο Τζον Σάμπσον, νιώθει πως οι φρενήρεις ρυθμοί των υποθέσεων τον κάνουν να χάνει πολύτιμο χρόνο από την οικογένειά του, δοκιμάζεται για τρίτη φορά αισθηματικά (μιας και οι προηγούμενες δύο περιπτώσεις στα αντίστοιχα βιβλία δε φτουρήσανε), αυτήν τη φορά με τη νέα, έγχρωμη διευθύντρια του σχολείου του γιου του (είναι παντρεμένη όμως!) και μαθαίνει πως ο Λευκός Οίκος τον επέλεξε ακριβώς γιατί είχε τις σημαντικές επιτυχίες του στις υποθέσεις Σόνετζι και Καζανόβα. Για πρώτη φορά εμφανίζεται η ψυχαναλύτριά του, Αντέλ Φάιναλυ, στην οποία καταφεύγει αραιά και πού, και μόνο όταν έχει απόλυτη ανάγκη να μιλήσει σε κάποιον έμπιστό του. Οι γνώσεις του στην ψυχολογία εφαρμόζονται λίγο καλύτερα σε αυτό το βιβλίο, μιας και αγωνίζεται να καταλάβει το προφίλ των ενόχων μέσα από τους προσωπικούς τους χώρους ενώ η πάλη του με τον δολοφόνο των παιδιών είναι ένα καλογραμμένο κομμάτι ψυχιατρικής. Ο Σόνετζι εξακολουθεί να τον στοιχειώνει, δε διστάζει μάλιστα να του τηλεφωνήσει στο τέλος του βιβλίου για να του ευχηθεί «καλά Χριστούγεννα». Αναρωτιέμαι λοιπόν πώς θα ξαναβρεθούν αντιμέτωποι αυτοί οι δύο και πώς θα εκτιμήσουν οι ανώτεροι του Κρος τη διαρκώς αυξανόμενη φήμη του στην επίλυση εγκλημάτων (αυτός είναι και ένας από τους λόγους που διαβάζω αντίστοιχες σειρές βιβλίων με τη σειρά που γράφτηκαν και δημοσιεύθηκαν). Το «Τζακ και Τζιλ» ως προς το θέμα του είναι ένα καθαρά αμερικάνικο θρίλερ, με όλες τις δόσεις αγωνίας, ανθρωποκυνηγητού και αμερικανολατρείας που απαιτεί ένα τέτοιο κείμενο και ξέρει ο συγγραφέας να χαρίζει κατά κόρον. Από την άλλη ούτε σε αυτό το βιβλίο χάνει την ευκαιρία να στηλιτεύσει κάποια πράγματα: «Πρόσφτα είχα διαβάσει μια στατιστική που σου μαύριζε την ψυχή, σύμφωνα με την οποία ο μέσος Αμερικανός αντλούσε το εβδομήντα τοις εκατό των πληροφοριών του από τον κινηματογράφο και την τηλεόραση» (σελ. 205). Έχω βέβαια δύο πραγματολογικές ερωτήσεις (π.χ. ο δολοφόνος των παιδιών αρχίζει να ουρλιάζει μπροστά σε δύο θύματά του και πυροβολεί αρκετά αργότερα εξ επαφής, στο μεσοδιάστημα αυτό όμως ο συγγραφέας δε γράφει αν υπήρξε κάποια αντίδραση των θυμάτων, αν ξύπνησαν κλπ. ενώ αυτός ο άνθρωπος στο τέλος του βιβλίου περιγράφεται εξονυχιστικά σε μια ολόκληρη παράγραφο μόνο που δεν αναφέρεται ότι φορά γυαλιά, κάτι που περιγράφει φευγαλέα ο Κρος κάποια στιγμή!) αλλά σε γενικές γραμμές έμεινα ευχαριστημένος με την περιπέτεια αυτή. Number 3 in he Alex Cross series and this time Alex has not one but two killer to hunt down. Two young children have been brutally murdered. Alex and his friend ,and fellow cop, Samson feel the need to get to the bottom of this asap. All the more so because Alex's kids attend the very same school that victims attended. To make matters worse there are two psychopathic killers (Jack & Jill) running around killing high profile citizens. Needless to say the FBI and the NYPD need Alex on the case. A Number 3 in he Alex Cross series and this time Alex has not one but two killer to hunt down. Alex finds himself trying to solve both cases at the same time, not an easy task. The end game, I thought, was a bit over the top. But, what the, this is make believe after all. The other thing that grates on my nerves a bit was when ever Alex's kids or Nana Mama are mentioned the dialogue can be a bit cringe worthy. But this is just a small complainant in what proved to be a quick, enjoyable read. This is an older Alex Cross novel. I just finished Postcard Killers (a newer novel) about a month ago, and there are a lot of similarities with the J&J killers. The biggest mystery of the book was trying to figure out why the killers did it, which is never answered completely. At the beginning J&J are playing with a game board of some kind, but that is completely forgotten after a few chapters & has nothing to do with the motive. There are too many red herrings to the point of sloppi This is an older Alex Cross novel. I just finished Postcard Killers (a newer novel) about a month ago, and there are a lot of similarities with the J&J killers. The biggest mystery of the book was trying to figure out why the killers did it, which is never answered completely. At the beginning J&J are playing with a game board of some kind, but that is completely forgotten after a few chapters & has nothing to do with the motive. There are too many red herrings to the point of sloppiness. When it comes to the end, you're scratching you head b/c there were not any clues to the identity of the killers. Alex Cross has another case with children being murdered in a schoolyard. Again, too many red herrings and the killer's motive never is clearly seen. The killer is only after black children and you never know if it was just opportunity or racism. A point of note is that the future Mrs. Cross, Christine, is introduced. The reason I bought the audio was because John Rubinstein did part of the audio. He does the John Kellerman audios and in this plays all the killer's voices. Blair Underwood is the voice of Cross and he is awful. I may be biased, but I wanted Morgan Freeman because Underwood read too fast & it's hard to keep up the change in scene. Rubinstein was wonderful and did not jell will Underwood. This may have been the best Patterson novel I've ever read including all stand-alone's and other series of his, it was that good! It was full of action from the get-go especially that there wasn't just one killer, there wasn't even just two, there was three. Two working together as Jack and Jill who are murdering well known celebrities and then also the Truth School killer who's murdering little kids. Both are shocking cases but maybe for different reasons. There is an element of racism in this This may have been the best Patterson novel I've ever read including all stand-alone's and other series of his, it was that good! It was full of action from the get-go especially that there wasn't just one killer, there wasn't even just two, there was three. Two working together as Jack and Jill who are murdering well known celebrities and then also the Truth School killer who's murdering little kids. Both are shocking cases but maybe for different reasons. There is an element of racism in this book as their seems to be with all of the Cross novels. The kids being killed by the Truth School killer are black and the celebrities are both white, rich and powerful, so guess who gets the most attention from the police force in Washington? Of course Alex contests this strongly but is forced into working more on the Jack and Jill case by his superiors. He still works on the child murders as much as he can though proving how a lovely, honest character he truely is. One of the things that enriches the character of Alex Cross is his family. It makes him seem more real and shows a dimension of his humanity that goes beyond his work. This story is made more intense by the threat his work sometimes brings home to his family. When tracking a serial killer, it can become difficult to determine exactly who is the prey and who is the predator. The two simultaneous cases that Alex works in this story serve up plenty of tension and excitement. A child killer strikes c One of the things that enriches the character of Alex Cross is his family. It makes him seem more real and shows a dimension of his humanity that goes beyond his work. This story is made more intense by the threat his work sometimes brings home to his family. When tracking a serial killer, it can become difficult to determine exactly who is the prey and who is the predator. The two simultaneous cases that Alex works in this story serve up plenty of tension and excitement. A child killer strikes close to home when a little girl is found dead near his son's school. But at the same time, a pair of psychos who go by the names Jack and Jill start a spectacular series of celebrity killings. The child killer is a personal matter as much as a professional one, but Alex is forced by his chief to put most of his energy into the Jack and Jill case. আচছা! একটা থরিলার বইয়ে কয়টা খুন হতে পারে? একটা জিনিস কলপনা করে দেখেন... লুডু খেলার বোরডের মতো একটা বোরড, যেখানে বেশ কিছু বিখযাত মানুষের (পরতযেকেই যার যার সেকটরে বিখযাত) ছবি সাঁটা। দুইজন পরাপত ব আচ্ছা! একটা থ্রিলার বইয়ে কয়টা খুন হতে পারে? ঐদিকে আবার আরেক কাহিনি... একের পর এক খুন হয়ে যাচ্ছে ছোট ছোট বাচ্চারা। খুন হবার পদ্ধতিটিও খুব বিভৎস। অবশ্য এ খুনগুলোতে কোন প্যাটার্ন মানা হয়নি। একটু অগোছালো টাইপ... তবে প্রতিটা খুনে বুদ্ধিমত্তার ছাপ স্পষ্ট। আতংকিত স্কুলের শিক্ষক-শিক্ষিকাগণ এবং সেই সাথে অভিভাবকবৃন্দও। নেক্সট কার পালা? সবচেয়ে বড় কথা এই নৃশংস খুনগুলোর কারণই বা কি! আর খুনি কি এক?একাধিক? নাকি ততোধিক? I hated this book. It was recommended I read this by a friend who said this was a great series and this one was one of the best of this series. Wow, I can see we do not have the same taste. It was awfully written, implausible, and quite ridiculous. I will not read any more Alex Cross if the rest are like this. Alex Cross is back in this, the third installment from top-selling American author, James Patterson. The action starts with the murder of a US Senator. Closer to home, a young girl is also found dead. The body-count soon starts to mount and Homicide Detective Alex Cross becomes the go-to man. Cross is torn between the two seemingly unrelated serial murder cases. The young children being murdered attend Cross's own sons school and therefore have personal significance for Cross. But the political Alex Cross is back in this, the third installment from top-selling American author, James Patterson. The action starts with the murder of a US Senator. Closer to home, a young girl is also found dead. The body-count soon starts to mount and Homicide Detective Alex Cross becomes the go-to man. Cross is torn between the two seemingly unrelated serial murder cases. The young children being murdered attend Cross's own sons school and therefore have personal significance for Cross. But the political crimes are high profile and a nation wants the killer(s) caught. Perhaps the deaths are related? Jack & Jill gives a creepy insight into the inter-workings of our government. Although, it is a fiction novel, Im sure the plans that took place in this novel have been attempted before. Jack & Jill are two high profile killers in Washington D.C. They kill people that are held high in the public eye and are working their way towards their ultimate goal -- Killing the real Jack & Jill -- Mr. and Mrs. President of the United States. Can Alex Cross catch them before it is too late? At th Jack & Jill gives a creepy insight into the inter-workings of our government. Although, it is a fiction novel, Im sure the plans that took place in this novel have been attempted before. At the same time, there are mysterious children murders happening in Cross's neighborhood. With his heart in trying to solve the case, he gets pulled off and put on the Jack and Jill case. He goes undercover with his partner Sampson and a few guys from their department to try to solve the cases themselves. The cases aren't getting much attention because of the high profile murders. This novel is fast paced and keeps you guessing until Patterson is ready to reveal the whole story to you. The Jack and Jill killings were intimate but lacking emotions. The child murders left me quite sad and cringing. Patterson nails another great book. Alex Cross is called in for a big crime, a killing duo who have named themselves Jack and Jill. Jack and Jill are 2 regular people who are tired of the rich and famous. They begin to kill those who they dislike, beginning with a US senator. Jack and Jill are aiming high and have their sights set on the President. In Alex Cross' neighbourhood, also where his son goes to school, someone is killing children and leaving their bodies on the school property. Obviously, Alex Cross is feeling worried for Alex Cross is called in for a big crime, a killing duo who have named themselves Jack and Jill. Jack and Jill are 2 regular people who are tired of the rich and famous. They begin to kill those who they dislike, beginning with a US senator. Jack and Jill are aiming high and have their sights set on the President. In Alex Cross' neighbourhood, also where his son goes to school, someone is killing children and leaving their bodies on the school property. Obviously, Alex Cross is feeling worried for his son and the other children that go to the school. Cross and his superiors are having problems on deciding which case he should work on, but of course Alex Cross is going to solve them all! I'm still trying to decide if I like Alex Cross or not, which is upsetting to my husband since he is Alex Cross' biggest fan. Some of his inner dialogues don't seem to be real and are a bit eye-roll worthy. However he seems to be a good detective and doesn't just care about solving the crimes, but saving those who are potential targets. I liked the fast paced action of this novel and that there was 2 crimes going on. My big negative is that Alex Cross didn't do any real detective work to find the killers. I listened to this book on audio and really enjoyed the experience. The evil doers, Jack and Jill and the Truth School killer is written with enough humanity interwoven to make the reader somewhat conflicted. That is an excellent skill, making the bad guys, human enough for the reader to find something to associate with. I really loved the story. The narrators being split between masters of storytelling made this a true production. This book deserves it's four stars. I love thrillers but this one missed all the marks. I found that the villains' motivations were not explored thoroughly or believable or were just plain too simplistic. It is basically evil for the sake of being evil and in real life things are a lot more complex than that. I listened to an audiobook version found on my library which was only 3 hours long, so maybe the actual book was more thorough, we'll never know because I don't plan to find out. A good, solid introduction back into the world of Alex Cross. I'm kind of excited that I have the entire series ahead of me still to read. I adore the Michael Bennett series and I thoroughly enjoyed this Alex Cross novel.